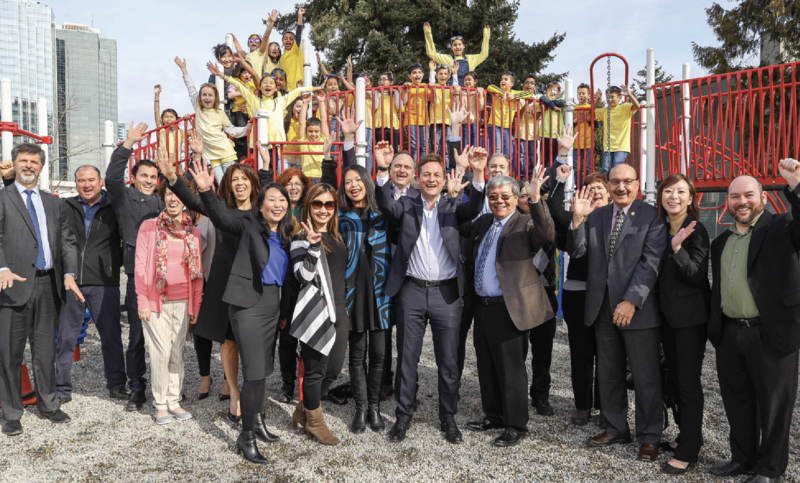 Three new playgrounds have been announced for Burnaby Schools. The playgrounds will be built with provincial funding over the coming months at Maywood Community School, Second Street Community School, and Sperling Elementary. Maywood’s playground will have special accessible features. The official announcement was made by the Government of BC last month to some very happy faces at Maywood Community School. Play is important in children’s lives. While enjoying themselves and getting exercise, they’re also developing social and problem-solving skills. The Government’s Playground Equipment Program (PEP) will invest $5 million in 50 new playgrounds in 34 school districts around the province, including 30 universally accessible playgrounds. Read the Burnaby Now story. 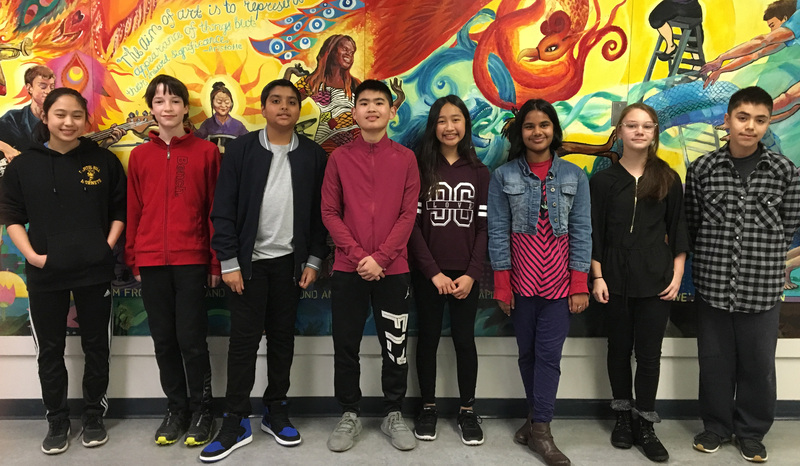 At a special event held at the Centre for Dialogue at Byrne Creek Community School in March, the District’s top eight Grade 7 orators delivered their speeches to an audience of family, friends, teachers, administrators, and a panel of esteemed judges. Every Grade 7 student in the District is required to write and deliver a 3-5 minute speech on a common theme to their classmates. The annual event began in 1983 to provide elementary students the opportunity to develop their confidence and pursue excellence in public speaking. The two top speakers at a school level are chosen to attend their zone’s semi-final. The top two students from each semi-final then advance to the District Final. It is always a very difficult task for judges, but at the end of the night, three students are selected as the Grade 7 Public Speaking Champions. This year, students were challenged with “I may be young but…” as the starting point for the subject of their speeches. Competitors were judged on their content and delivery. They are not allowed any visual aids or props. It’s just them, their voice, and the audience. All eight speeches were excellent. Topics ranged from global warming to mental health with fresh perspectives, insight, and professional deliveries to back it all up. 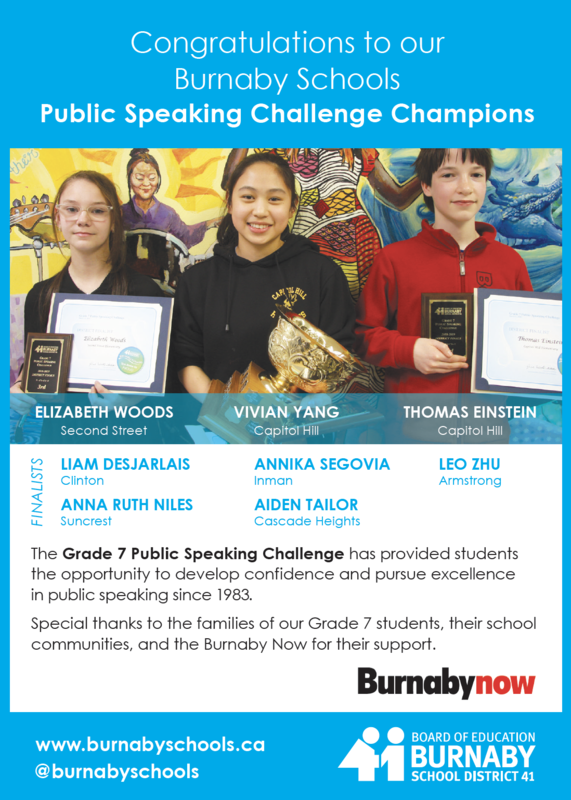 The top three Grade 7 Public Speaking champions are highly sought after to present at District and community events. Their speaking engagements include: a public meeting of the Burnaby Board of Education, the Burnaby Retired Teachers’ Association, and the District’s Words Writing Project celebration held at Michael J Fox Theatre. We want to acknowledge each student who presented in their schools. It takes courage to stand up and speak in front of your peers. Thank you to staff and parents for their ongoing encouragement and support. And congratulations to all of our District Finalists. Thank you to the Burnaby Now for their ongoing sponsorship of this event. See the Burnaby Now ad below. 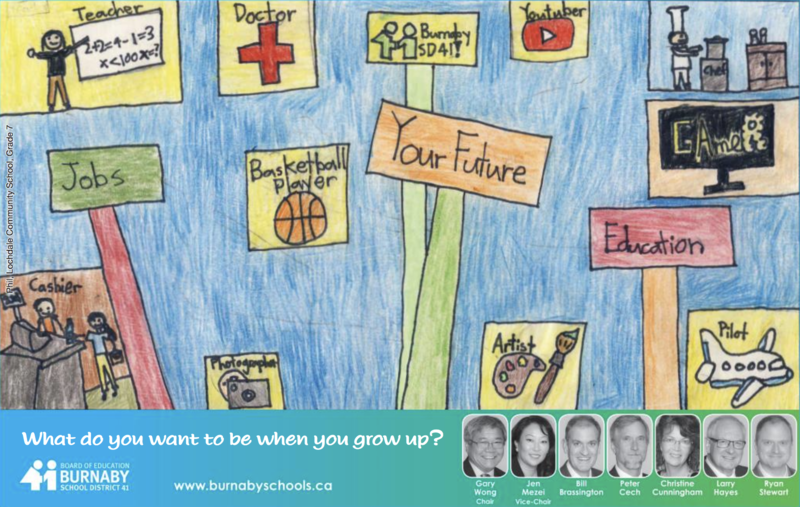 This year’s “Design An Ad” theme for the Burnaby School District is, “What do you want to be when you grow up?” See the full Burnaby Now “Design an Ad” feature – link below. Have a look at the Design an Ad feature in the Burnaby Now. What is Design an Ad and why do we do it? What do you want to be when you grow up? This question has persisted for generations, and it’s even more complex for our students today. By the time this year’s Kindergarten classes graduate from high school there will be professions that we couldn’t imagine now. For example, who could have predicted that talking on YouTube about video games could earn someone a reported six-figure income? At Burnaby Schools we create a learning experience that empowers students with the skills they need to succeed – no matter what the future brings – such as creative and critical thinking. In the “age of Google” being able to recite facts no longer holds the value it once did. One of the important opportunities the Burnaby School District provides is career exploration. This competition for Design an Ad is but one example of that: a chance to try marketing and advertising. Another is Burnaby Schools unique Words Writing Project, which gives our students a chance to become published authors. When students reach the high school level, there are dozens of additional career exploration opportunities, which are further strengthened by our partnerships in this community with post-secondary institutions and industry. Our Programs of Choice include diverse offerings such as video game design, trades, hairstylist, tourism, cyber security, health sciences, and exploring the world of engineering. These and other choices give students the chance to excel in a specific area of interest, while fulfilling academic requirements and igniting their future. We won’t rest on our collective success as a District. We are always challenging ourselves to be better. It’s that desire to do more that has led to educational choice that allows our students to explore their interests, support their strengths, or get exposed to a career.